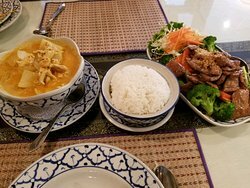 Outstanding Thai food in San DimasDelicious Pad See Ew!... 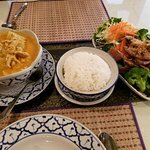 Chicken Pad Thai, pineapple fried r...The PAD Thai is awesome and so is the Pad Prik King with Beef. Classic​ Thai rice noodles stir- fried w/ your choice of chicken, pork or beef & egg, bean sprouts, green onions & crushed peanuts. 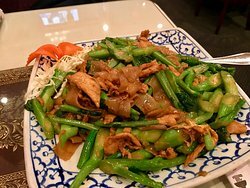 Stir-fried flat noodles topped w/ soy bean gravy sauce, chinese broccoli & choice of chicken, pork or beef. 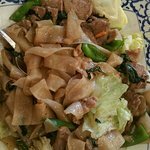 Stir-fried flat noodles w/ egg, chinese broccoli, black soy sauce & choice of chicken, pork or beef..
Rice noodles soup w/ boneless chicken, bean sprouts & green onions. Fresh banana cut up bite size, wrapped in wrapper & deep filed, topped w/ honey & sesame seeds. Thai med donuts served w/ our secret homemade sauce & topped w/ crushed ground peanuts. Pantry the puff paratha (roti) gently in to the pan & turn it over until both side are golden brown & served w/ our secret homemade sauce. Crunchy banana coins on top of homemade coconut ice cream. Honey & sesame seeds. Lettuce, tomatoes, carrots, boiled egg, chicken, shrimp & topped w/ peanut & dressing, vegetarian style is available. Shredded raw papaya mixed w/ green beans, tomatoes, ground peanut & dried shrimps, seasoned w/ lime juice & fresh chili. Bean thread, ground chicken, shrimps, onion mixed w/ lime juice & fresh chili. Served on a bed of lettuce. White squid seasoned w/ onion, line juicer fresh chili & topped w/ green onion & cilantro. Grilled shrimps tossed w/ lettuce, onion, lime juice, fresh chili & topped w/ green onion & cilantro. Light deep flied whole pompano topped w/ outstanding chill garlic sauce. 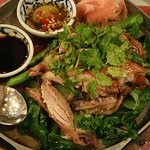 Steamed​ whole fresh stripe bass in spicy hot & sour soup. Light deep flied whole‏ fresh trout w/ & & curry soup & mixed vegetables. A typical Thai dish, grilled jumbo shrimps tapped w/ chu-chi curry sauce. Outstanding red curry salmon shrimps, squids scallops, mussels, bell pepper, coconut milk & basil leaves. Sliced tender beef stir-med w/ garlic & black pepper & layered over a bed of broccoli & carrot, sprinkled w/ green onions. Sauteed sliced tender beef, chicken or pork w/ fresh broccoli & oyster sauce. Sauteed​ beef w/ fresh ginger, bell pepper, onions, carrots & straw mushrooms. Stir-med ground beef w/ basil leaves, bell pepper, chili & garlic. Stir-fried sliced tender beef w/ Thai curry paste, green bean & bell pepper. Sauteed sliced tender beef w/ chill paste, bell pepper, bamboo shoots & basil leaves. 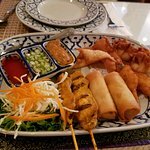 As someone who's lived in Thailand, I'll say: this food is excellent! 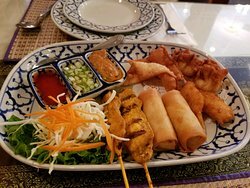 Much more authentic than other American Thai restaurants. Delicious Pad See Ew! 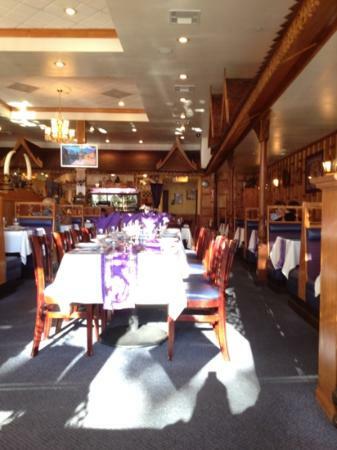 One of the finest Thai restaurants in the San Gabriel valley. Always great and quick service. Their food is exceptional. The PAD Thai is awesome and so is the Pad Prik King with Beef. 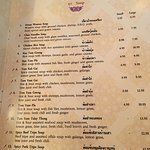 The Tom yum taleg tong soup is absolutely amazing. Love their food, their salads are outstanding. Good atmosphere and service as well. They take your order in a few minutes and check on you often. Would recommend for friends, and family as well as large groups. Lucky Elephant is my coworker and my "go-to" place for a great Thai food lunch. 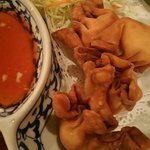 They have great decor and reasonably priced lunch combos complete with appetizer and soup. When we get the chance to go out for lunch, we are always "feeling Lucky"! Get quick answers from Lucky Elephant staff and past visitors.